By Kelvon Yeezy in Internet. Updated on November 18, 2017 . There are tons of productivity apps out there that promise a wide variety of features. However, needs like keeping a to-do list short, sharing workspace with other users and postpone projects for later are features you crave getting in a single place. Postpone ticks all three boxes and while it may not be targeted for a specific crowd of avid users, freelancers can benefit from it to ramp up their productivity and improve collaboration alongside this simple Web tool. After signing up for your account for free, you will be directed to a simple and clean interface where you can add your tasks easily. Fun thing about this app is that you can even add tasks via voice. When you are done with the title of your task, you can add any additional details. It gets more exciting when you press the ‘Share” icon on the left of each workspace. 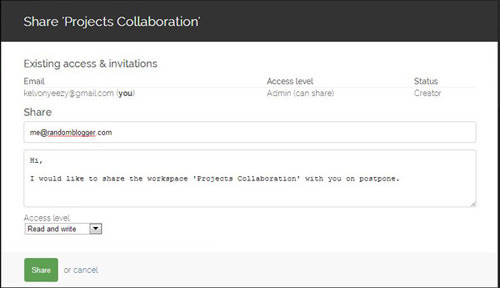 The option opens a box where you can share workspace with other users for further collaboration. Just send the invitation via email address. Postpone also gives you the option to send reminders to yourself, hence the name Postpone. The Snooze box allows you to postpone tasks by inserting a specific time like tomorrow at 8am, Tuesday, in 2 hours, etc, or else you can opt for selecting any of the predefined snooze choices, such as, this evening tomorrow, next week. You can always to choose whether or not the system will notify you when the postponed time hits the clock, then the tasks will appear in the task box. I honestly expected a full calendar view that would make postponing more natural and convenient, plus an option to track the progress of the project. Postpone comes with a chrome extension that simply displays the number of tasks that are ready to be performed. This may come in handy for alerting users about the amount of tasks available. The free sign-up is limited to create only 3 workspaces; however you can add more workspaces by connecting the app with Twitter, Facebook or sending a tweet about Postpone. The premium upgrade costs $9/month and comes with unlimited workspaces. The fee might discourage users while there are much cheaper and feature-rich to-do lists managers like Wunderlist and Any.do. However, the simplicity on Postpone is one factor that will win users over. There isn’t any snooze command for postponed tasks. 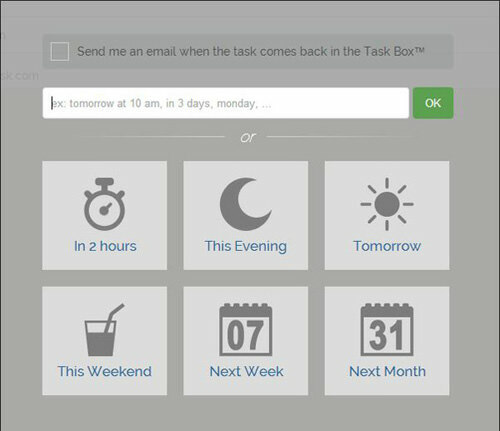 You have to wait until it returns back to the task box or you have to create a new task and postpone again to your desired time which is a hassle. Secondly, the light yellow display that appears at the top of the task is not an attention-grabbing design; users might miss the alert, which defeats the purpose. Lastly, when it comes to managing complex tasks where you may need to assign tasks to multipler users, this tool leaves the users in the lurch. As it was early predicted from the name of the tool, this app is more focused on postponing tasks in natural ways so that you can focus on your other priorities. While other features are in the works including a mobile app, this tool can be a good option to help you manage your tasks and share workspaces.